Last week Ed and I tried Scotch Eggs for the first time. I've never heard of Scotch Eggs in my entire life. I learned about them sometime this year, I don't remember when, but it wasn't too long ago. I don't even remember where I heard about them - something I read, a podcast I was listening to, online - suddenly I just knew about them. 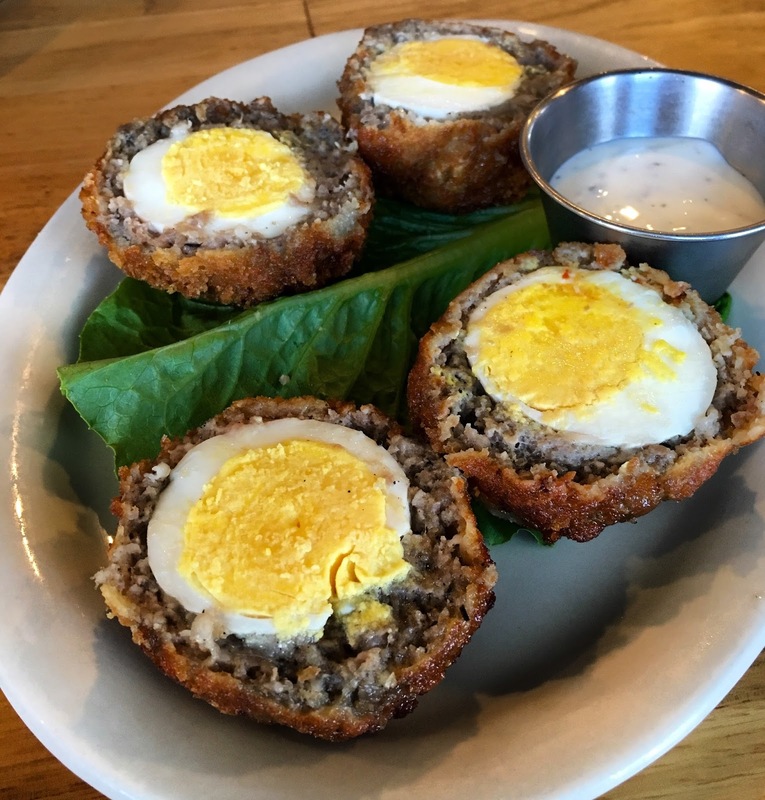 They're hard-boiled eggs, wrapped in in sausage, rolled in breadcrumbs, and deep fried. I read that sometimes people bake them, but I think fried is probably the way to go. We liked them, although something was missing. I thought they might be salty because of the sausage, but they weren't, they just weren't as flavorful as I thought they'd be. I added a sprinkle of salt and they perked up. I don't know that I'd eat these on a picnic, or packed in a lunchbox. I think they're probably best freshly cooked like we had them at this restaurant. Although, it is like a fried meatball in a way, so maybe they wouldn't be that bad. And they are definitely portable. Who else has tried Scotch Eggs and what did you think? Love scotch eggs but then I'm in the UK. Best fried rather than baked and eaten cold. Available in a verity of flavored sausage meat have a look here http://www.handmadescotcheggs.co.uk/Black-%20watch-pudding-%20scotch-egg. You have just started your journey! MICK: I REALLY don't think I could bring myself to eat black pudding. I'd have to be tricked into it, because I couldn't do it knowing what it was, since I know what's in it. What does it taste like? Salena Yes black pudding maybe something to try first before finding out its main constituent. It's very spicy large amounts of salt and black pepper as well as other spices like coriander seeds mustard seed pimento. Texture is added with fat and oat meal. Just realized that I have probable made it even less appealing. Every maker has his own secret recipe but it is just the specs that rearly alter. It's just like eating a sausage and you have no idea what its main constituent is. In my opinion a good black pudding is the food of Kings!